Too many people today spend their waking hours doing work they hate, or at least barely tolerate. What a waste of human potential. At a time when we need more people to contribute solutions to our pressing problems, to bring energy to help businesses succeed, to find new paths for a better world, we can no longer afford to work in ways that are numbing, draining, or demoralizing. We can’t afford it at a human personal level and we can’t afford it at a global economic level. While many companies say their employees are their greatest assets, few executives are working tireless to create work environments that renew and replenish their workforce. Organizations are social institutions. We create them, we can change them. Here are a few websites that are helping organizations shift how they see themselves. Self-awareness and self-reflection are the first steps to self-improvement. Glassdoor.com is a website to help you rate your workplace. The Employee’s Choice award goes to those companies whose employees give high approval for their company. Some forward-thinking executives are using this website to gauge their employee satisfaction and engagement. The Good Company Index provides ratings of Fortune 100 companies based on various social responsibility categories and human capital criteria. This index can also be used to support your efforts to have a workplace that cares about its people. The research of McBassi and Co. has shown that companies high on their index outperform S&P 500 companies. The Great Place to Work website offers ratings and ideas on best practices for employee engagement. For over 25 years this organization has helped set benchmarks for firms from a human capital perspective. Engagement is at the heart of any successful firm, quite literally. Companies that spark the creativity and hearts of their staff succeed over the long haul. Finding and creating meaningful work, work that speaks to your heart and soul, work that allows you to share your gifts, passion and purpose, are the ones worth creating. Focus on what you can do differently so that your talents don’t go untapped, parked at the front door of your office. No employer wants to see good talent go to waste. Talk with your boss or co-workers about ways you can enliven your workplace. 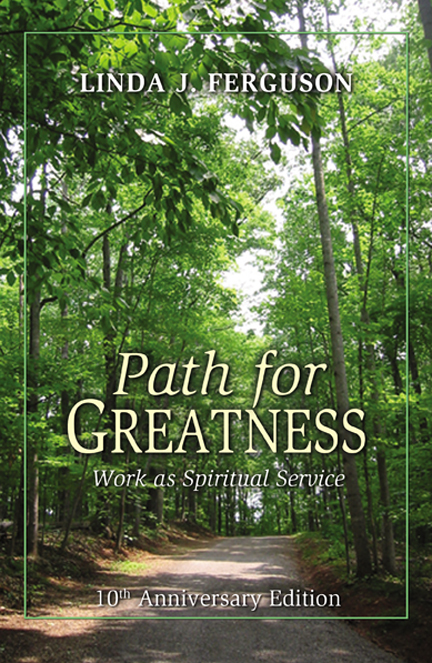 For more ideas for working with passion and purpose, read my book, Path for Greatness: Work as Spiritual Service, now out in the 10th anniversary edition. Bright Blessings as you bring your gifts, passion, and purpose to work in meaningful ways. 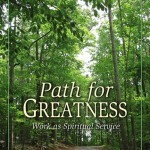 Dr. Linda J. Ferguson is an author, speaker, consultant and seminar leader. Visit her website- www.lindajferguson.com for more information about her transformative work. Linda has a Facebook Fan Page – https://www.facebook.com/LindaJFerguson “Like” this page if you want to get notices of these blog posts and other updates of Linda’s work.